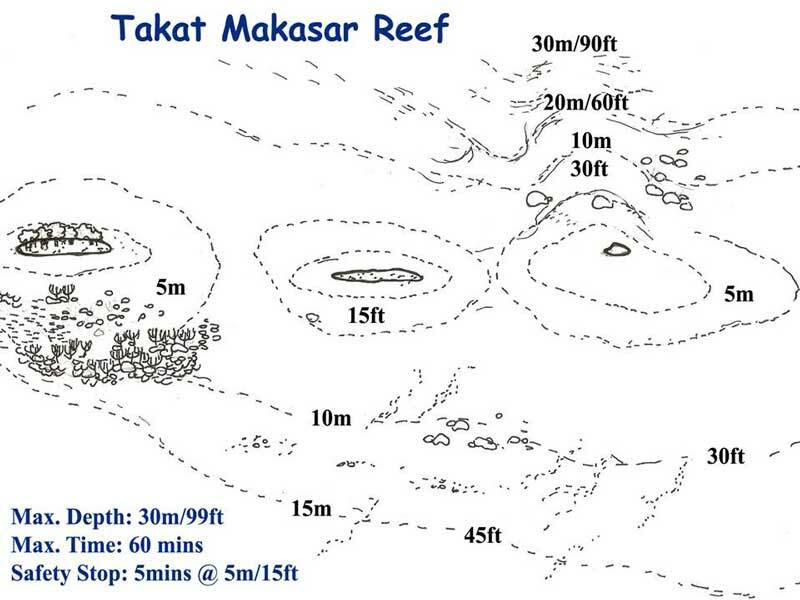 Takat Makassar is located in Linda Strait which is between Komodo and Rinja (Rinca) Islands. 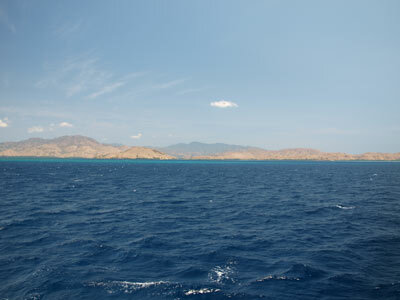 The dive is a drift to the south along the east side of a series of sand cays. An approximate GPS mark for the entry spot is 8º 32' 6.5"S 119º 36' 7.7"E (using WGS84 as the datum). The starting spot is towards the west from the GPS mark. 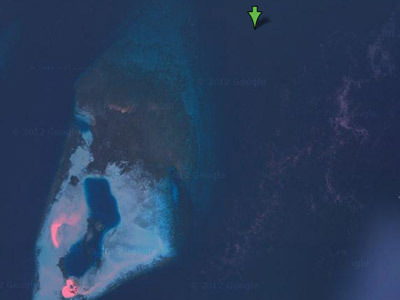 As mentioned, the actual dive is a drift to along the eastern side of a series of sand cays. You drift along from the start and surface wherever you want to. 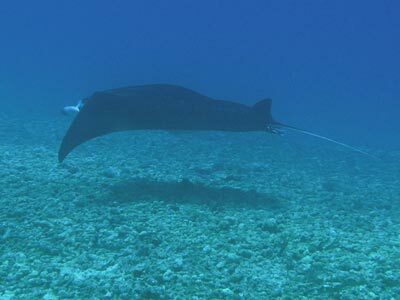 The sole aim of this dive is to see manta rays. As with virtually all dive sites that you do when on MV Mermaid II, you use the RIB (rigid inflatable boat) to get to the start of the dive (and also to get back to the boat). The RIB will drop you normally about 50 metres off the sand cay. We actually did this dive twice, surfacing and going back to near the start and doing it over again (using the same tank). Once in the water, we drop to 8 metres and then went a bit deeper to 12 metres. On the second dive, we dropped to 15 metres. The current was running north to south and was fairly strong in spots. I calculated that it was running at about two knots at its strongest (you cannot swim into two knots) and about half a knot at its lightest. The bottom here is sand which slopes from shallow to about 18 metres. There are some small coral bommies, but mostly on the deeper part there is not much other than sand. 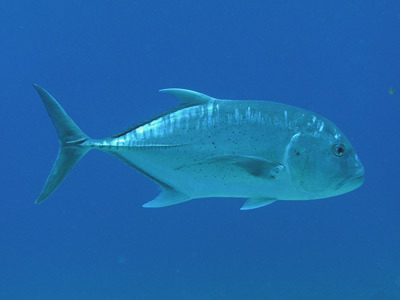 As we drift along, we gradually came shallower to 8 metres (on the first dive) but on the second dive we stayed deeper at 15 metres before coming up to 10 metres. After about 15 minutes on the first dive we hear our dive guide signalling. We have lost sight of him as he has got well ahead of us. 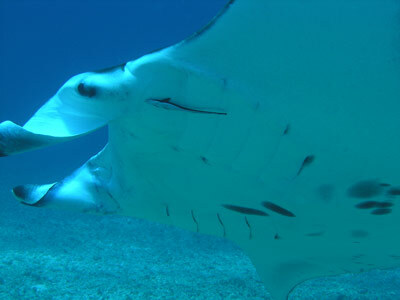 A minute later a reef manta ray comes from the shallows and circles around a coral bommie. Luckily the current here is only half a knot so we can turn around and stay in the one spot while we watch it. After a circle of the bommie, it swims almost straight over me and then heads over Kelly who is about 20 metres behind me. It then disappears to the north. Brilliant! 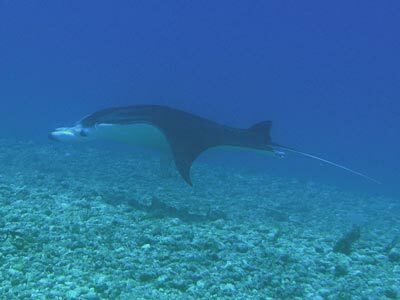 On the second dive we are only in the water about 10 minutes at the most when another reef manta ray comes from the deeper water. It passes other people and then swims past me and almost over Kelly. Another great encounter. Bot dives end when we head into the shallows. 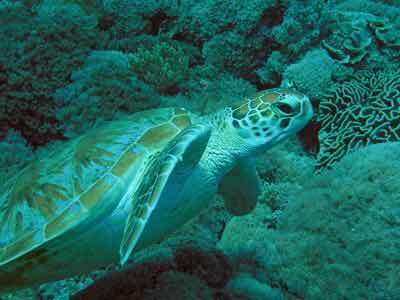 Here there are lots of cabbage type coral and also turtles and some other interesting fish like titan triggerfish. I get some nice photos of a turtle. 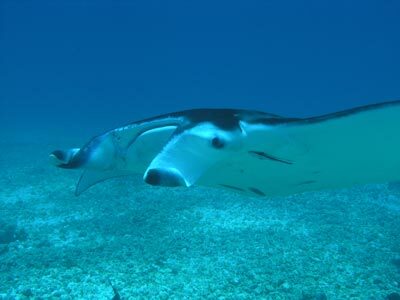 As mentioned, on the first dive we lost our guide and since he had suggested doing the dive twice, when we saw no more mantas we surfaced and got picked up by the RIB. The second dive was just as good as the first. We ended up doing 32 minutes and 34 minutes. This was an excellent dive, only the third and fourth times I have ever seen manta rays. The visibility was probably 30 metres and the water temperature was about 27ºC. Click here to return to see the dive profile from my computer for the first dive.